The Class of 2022 Officers invite classmates, student leaders, faculty and staff to celebrate the first 100 days of their EC experience. 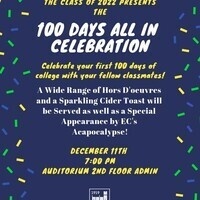 Enjoy hors d'oeuvres, dessert and a sparkling (mock) toast as we reflect on the first semester and look forward to the future! Co-sponsored by the Class of 2022 Officers, New Student Engagement & Transition and the Office of Student Activities & Multicultural Programs.